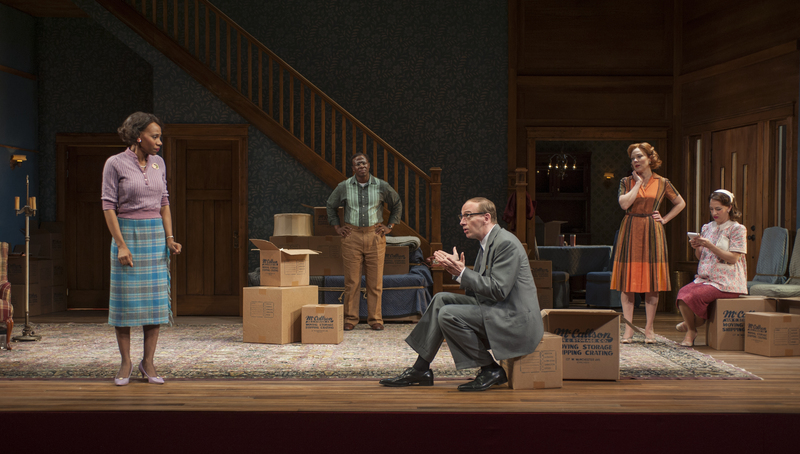 1179: Shá Cage (Francine), Ansa Akyea (Albert), Jim Lichtscheidl (Karl), Kathryn Meisle (Bev) and Emily Gunyou Halaas (Betsy) in the Guthrie Theater’s production of Clybourne Park, by Bruce Norris. Directed by Lisa Peterson, set design by Rachel Hauck, costume design by David Zinn and lighting design by Mark Barton. June 1, 2013 – August 4, 2013 on the McGuire Proscenium Stage at the Guthrie Theater, Minneapolis. Photo by Michael Brosilow. What is there to write about Clybourne Park that has not already been written? The hype around this play can feel a bit stifling. Winner of the 2011 Pulitzer Prize, this “strong, ferociously smart play” has traveled from New York to the UK, Rhode Island, Philadelphia, and now to the Guthrie. The English teacher in me wants to say that in order to truly understand the play, you need to know Lorraine Hansberry’s A Raisin in the Sun, to which this play is a modern reaction. And to understand A Raisin in the Sun, you should understand the restrictive covenants created by communities that shaped so many of our urban and suburban neighborhoods. But of course you don’t need to know all of this to understand the heart of the play, and that’s some of the genius of it. We already know the content and the complexity. I’ll use a personal example: a friend of mine, a young woman of color in her mid-30s, recently moved from the Rondo neighborhood in Saint Paul to Longfellow in Minneapolis. Her colleague, a mid-50s white woman in a Volvo, helped her to move her things. As they began unpacking, my friend’s neighbors greeted her boss, welcoming her to the neighborhood and offering a hand, assuming that the older white woman was the person moving in. Once my friend was alone, moving the last of her boxes into her new apartment, the comments from passersby changed in tone. She was directly asked “where [she was] going” and questioned about her belongings. Apparently there have been a rash of robberies in the neighborhood. Quite a welcome, and sadly not surprising to a lot of us. Actually, for many Americans those moments feel about as familiar as the house in which Clybourne Park takes place. The first act is set in 1959, as a white family prepares to leave their urban home for suburbia, and the second act takes place fifty years later. Throughout the play Norris crafts reasons, some more convincing than others, for characters to gather in the living room of the house and explicitly state the assumptions about housing, communities, and race that are so often left coded. At times, being in the audience of this play feels painful. Even before the true drama of the first act unfolds, the couple Bev (played by Kathryn Meisle) and Russ (Bill McCallum) have already insulted a nearby grocery called Gilman’s (Irish, I assume? ), a developmentally disabled neighborhood boy, an overweight woman, and a deaf character. This is before they and their neighbors callously argue about the black family moving into the new home in front of Francine (Shá Cage), an African-American woman employed as a maid, and Jim (Ansa Akyea), Francine’s husband. While the audience laughed throughout the production, the tone of the laughter changed as some of the moments are truly cringe-worthy. Most uncomfortable is the way so many of the characters talk over each other, protected in their privilege, and so comfortable in their assumptions that they can’t even hear the person across from them. Overall this is an excellent production that’s worth seeing. Shá Cage, Jim Lichtscheidl, and Ansa Akyea stand out in this strong group of actors. Some of the moments are truly stunning, especially a chilling scene towards the end that reminds us of truly how personal the “political” can be. What this group of actors can’t save are the (relatively minor) pacing issues: the first act moves quickly and dynamically while the second act is more static, mostly because of the blocking choice to have the characters sit on identical chairs in a semi-circle. As a final note, while this play brings up some very important issues, I’d like to point out that this production choice is not necessarily a brave one for the Guthrie. Like Appomattox and The Scottsboro Boys before it, with Clybourne Park the Guthrie puts on a play about race written by a white man. Doing so is not revolutionary, even if the playwright chooses to address issues sometimes ignored on the Guthrie stage. While this play is a good first step, it would be even better to perform the work of an author of color next time.